For centuries, water has been recognized for its transformational healing properties. Making up about 55-65% of our bodies, it’s the means by which nourishment circulates through us. Being immersed in water can remind us of our natural human state. This is why aquatic therapy is incredibly beneficial for our physical and mental health. Also known as pool therapy, this popular treatment is used to calm the mind, address pain or improve athletic performance. 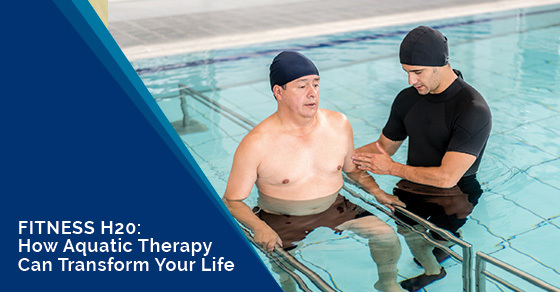 Aquatic therapy consists of exercise routines that are performed in the pool, allowing participants to take advantage of the buoyancy and resistance that water provides. Whether you’re a senior suffering from joint pain or an athlete in need of resistance training, aquatic therapy is beneficial for a diverse range of people. If you’re interested in exploring the advantages of this effective program, here are some points to consider. Water’s buoyancy has the ability to make you feel weightless. This is especially useful for participants who have difficulty performing certain workout routines due to weight issues. It’s also beneficial for pregnant women who are finding it difficult to continue exercising through traditional means at the gym. Water’s buoyancy dramatically decreases the amount of stress placed on the joints. Patients suffering from arthritis or fractured bones from some sort of trauma will particularly appreciate aquatic therapy. By reducing the amount of joint stress, it becomes easier and less painful to perform a variety of exercises. Sports like swimming and water polo are some of the most energy-intensive workouts around. This is largely because of the resistance that water provides. Resistance training can easily be incorporated into an aquatic exercise program. The viscosity of water provides an excellent way to strengthen the muscles without the need for weights. This combination of resistance and buoyancy allows participants to train certain muscle groups -- without the stress that traditional weightlifting places on the joints. Being in water provides a constant stimulus for our nerves. This continuous water pressure is something our bodies are not used to. That’s why the nervous system will automatically dull the reticular system. This is the part of the brain responsible for dealing with tactile sensations -- pressures and vibrations felt against the skin. This process can help dull muscle pain, so you can regain full range of motion much faster. It’s particularly helpful for those suffering from a sports injury or have chronic pain following a car accident. One of the biggest obstacles to workout sessions on land is the pain involved in moving injured muscles. The body must be slowly coaxed into various positions, which takes immense time and effort. Aquatic therapy provides near-immediate pain relief, which is why soaking in a hot tub helps alleviate sore muscles. Aquatic therapy forces you to move slowly because of water’s constant resistance and viscosity. This reduced speed allows your brain to process muscle signals more thoroughly, since it has more time to do so. Ultimately, the patient is forced to focus on taking the muscle properly through its full range of motion. For those suffering from a neuromuscular condition, like Lou Gehrig’s disease or multiple sclerosis, muscle retraining is made easier with water-based fitness. The water used for aquatic therapy is kept at warmer-than-average temperatures. Warmth promotes circulation, increasing overall blood flow to the limbs. Improved circulation can speed up the healing process by getting oxygen-rich blood to the body’s peripheries. Water also flows in currents when you move through it. This gentle flow of water molecules around your body acts as a massage, which can also improve circulation. Therapists will often use paddles or gloves to create gentle currents aimed at specific areas of the body. Thus patients emerge from the water feeling incredibly relaxed and limber. What are the goals of aquatic therapy? Aquatic therapy is becoming increasingly popular for adults and children of all ages and skill levels. It’s a safe alternative to many land-based programs that can exacerbate pain symptoms or increase the risk of injury. Patients looking to improve rehabilitation timeframes or fitness levels would find aquatic therapy highly effective. It’s important to note, however, that aquatic therapy is not for everyone. Those who have an infection, fever or bowel incontinence are not good candidates. Additionally, this type of treatment is not recommended for those who can’t swim. To find out whether aquatic therapy is right for you, speak to one of the health experts at Physiomed. Many of our clinics provide pool-based programs in a safe and professional environment and our Leaside clinic offers an underwater treadmill; the HydroWorx 200. Whether you’re trying to lose weight, manage arthritis symptoms or recover from injury -- Physiomed’s customized treatment programs can help you achieve long-lasting results. For more information on aquatic therapy or to book an assessment, contact us here.